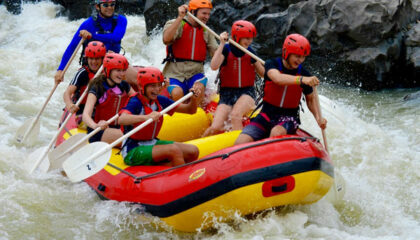 This is our comfortable and classic one-day white water rafting session. 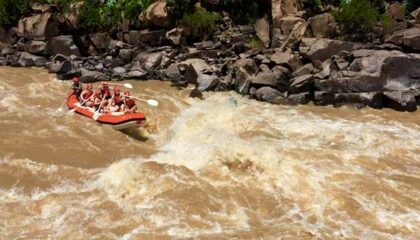 Where else, than the Tugela River? 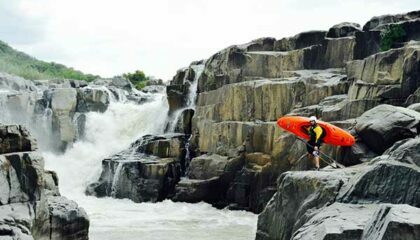 This is truly one of South Africa’s best white water destinations. The trip starts in the town of Bergville and finishes where the river flows into the Spioenkop Dam. You are looking at a trip of about 5-6 hours. 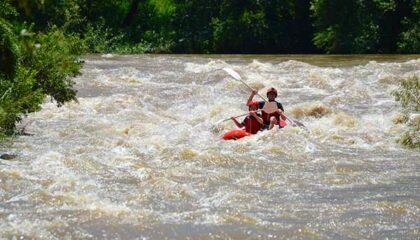 This piece of the Tugela River is surprisingly big, fast, continuous and very friendly towards the person who is not the everyday rafter. Rapids up to Class 3+ can be expected. Depending on group composition we run this section with either 2-man inflatable rafts (or Crocs) and/or 6-8 man inflatable rafts. The first half is mellow and very easy! Half way we stop for lunch and immediately afterwards the real action starts and keeps going until we reach the dam. If this is your thinking, this stretch is for you: I am keen for some white water today, but not that rough and tough type stuff. I want to be out there with the family, with the kids and all. The thrills and spills I am not interested in, the small bumps the beginner paddler would experience as exciting is what I am after. I don’t want to sit out there for hours either, just an hour or two will do. Bottom line, anyone can do it. 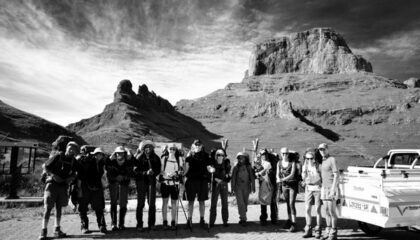 The Drakensberg Grand Traverse is a hike along the entire length of the Drakensberg Escarpment. In other words, all along the international border between South Africa and Lesotho. It can either be done in a north to south direction or south to north direction. It can be done in any length of time too. We have refined it down to a standard 14-day hike. The longest day is roughly 22 kilometres and the shortest around 8 kilometres. The average distance per day is roughly 15 kilometres. It starts at the Sentinel Car Park in the Northern Drakensberg and ends at Bushmans Nek in the Southern Drakensberg. It is roughly a distance of 230 kilometres with a total height gain of roughly 8000 metres. 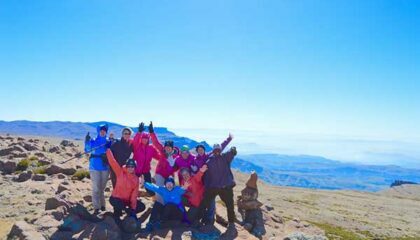 Six peaks are also summited which include Mont-Aux-Sources (3282 metres), Cleft Peak (3277 metres), Champagne Castle (3377 metres), Madafi (3450 metres and the highest point in South Africa), Giants Castle (3314 metres) and Thabana-Ntlenyana (3482 metres and the highest point in Southern Africa). Due to the length of the hike encountering a wide range of weather is good. Therefore we aim for the best time of the year to take it on, which is roughly from mid March to the end of May. The weather is then quite stable. Three resupplies are used to help share the carrying load. The most you end up carrying on the entire trip is only for four days. There are ample opportunities for viewing. Some of the peaks you will be climbing and a lot of the walking you will be doing is right on the edge of the escarpment. 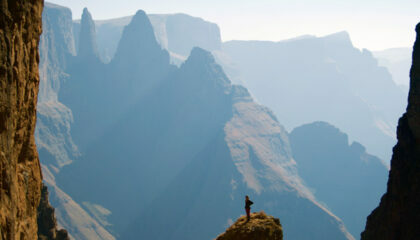 In addition, those deep and very far off valleys in Lesotho will also be seen, like the Yodlers Cascades. And to top it all, you are way out there in wild country, just the way we like it. It certainly is a thorough physical and mental challenge, but definitely a very big accomplishment when completed successfully. You have to be fit and you have to be use to carrying a backpack. 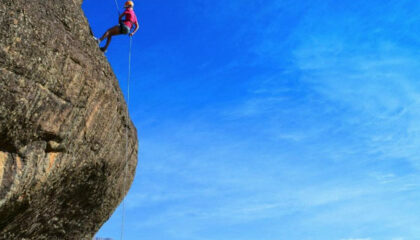 Together with Eagle’s Head, Mooihoek Mountain and Mount Everest are the other two main climbing areas at this venue. Climbing is mostly sport. Currently there are 140 bolted routes, with grades ranging from 9 to 28. 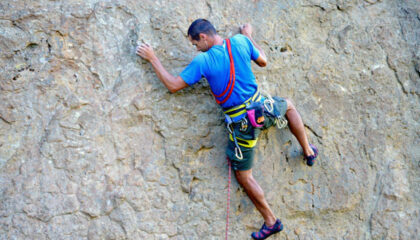 Good multi-pitch climbing can be done at the three main climbing areas with single-pitch climbing and bouldering on the underlying boulders. Accommodation consists of an excellent campsite and chalets. Our second regular one-day white water paddle. A bit shorter but equally as good. Action packed from start to finish. 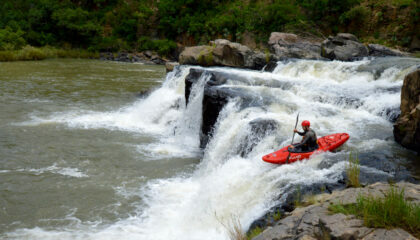 When the Tugela River really gets going there is some enormous white water to be encountered. Rapids ranging from class 1-5, no sweat. Depending on group composition we run this section with either 2-man inflatable rafts (or Crocs) and/or 6-8 man inflatable rafts! And when you’re done you will be pulling in at the Pig and Plough farm shop for a burger, pizza or a pie! Our flag ship route! 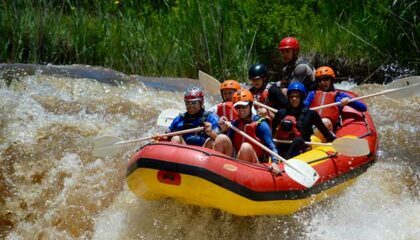 This is a four to five-day outing in the very beautiful Mnweni area of the Drakensberg. Even though the whole length of the Drakensberg is superb for mountain walking (hiking), this area is widely regarded as one of the ‘Berg’s top destinations. This part of the escarpment makes a large cutback (called the Mnweni Cutback), and as a result adds much isolation while moving through the area. The mountain passes to be encountered are the Mnweni and Rockeries Passes. Steep stuff and hard work. Be sure that your efforts will be well rewarded. Look out for major peaks like the Inner and Outer Mnweni Needles and Pinnacles. The highlight of the outing is without a doubt a full view of the loose standing Mponjwane, or Rockeries Tower. This is one of the Berg’s legendary peaks. Additionally, two nearby caves are available for overnight camping. This is a three-day outing starting on the rock around the town of Harrismith. 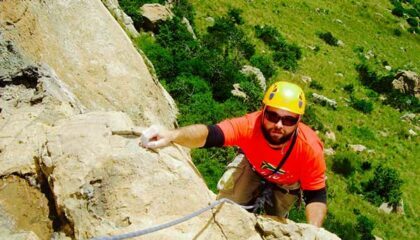 Then for some Tugela white water on day two, and then a beautiful abseil in the Cathedral Peak area of the Drakensberg on day three. Remember this is just one version of it. Feel totally freed to arrange these activities the way you like it. This four day outing consists of the full package. You will spend some time on the RIVER, ROCK and MOUNTAIN. Feel totally freed to arrange these activities the way you like it. This section of the Bushmans River is one of those highly featuristic sections. There is a lot happening on the water, all runnable! Waterfalls, waterslides, weirs, technical rapids, you name it! And it is remote, with some really nice bush all around. There is no chance that you will be seeing anyone else on the river. When this river gets going it becomes very exciting. The rapids becomes quite long with some really nice play waves in between. Yeah!